Retired Father Albert Ajamie died on Jan. 9 at the St. Augustine Home for the Aged in Indianapolis. He was 86. Father Ajamie suffered a stroke in 2004 that caused him to move from Our Lady of Fatima Retreat House in Indianapolis to the St. Augustine Home for the Aged. The Mass of Christian Burial will be celebrated at 11 a.m. on Jan. 15 at St. Monica Church in Indianapolis with Archbishop Daniel M. Buechlein as the principal celebrant. Burial will follow at the Priests’ Circle at Calvary Cemetery in Indianapolis. Retired Msgr. Lawrence Moran, who was in a priest support group with Father Ajamie for several decades, will be the homilist at the funeral Mass. Msgr. Moran described his friend of more than 50 years as having a wide variety of interests, including liturgy, teaching, racial justice, the charismatic movement in the Catholic Church and the arts. Msgr. Moran also had a deep appreciation for the way in which Father Ajamie understood and lived out his life and ministry as a priest. Father Kenneth Taylor has his own perspective on Father Ajamie, having known him as a teenager and a high school seminarian when the priest was his pastor at Holy Angels Parish in Indianapolis, where Father Taylor now serves as pastor. Holy Angels is largely made up of black Catholics, and Father Ajamie was a vocal supporter of racial justice during the 1960s, Father Taylor said. Father Ajamie, however, broadened young Kenneth Taylor’s views on multiculturalism beyond American racial issues by recruiting him to be a server at Melkite liturgies that his pastor celebrated across the archdiocese. Born in a Lebanese family, Father Ajamie was a biritual priest, being able to celebrate liturgies in both the Latin rite and the Melkite rite, which is historically rooted in Lebanon. Father Taylor said that it was this exposure to cultures in the Church far beyond those prominent in the United States that continues to help him in his ministry as the director of the archdiocesan Office of Multicultural Ministry. In his first pastoral assignment after being ordained a priest in 1978, Father Taylor also ministered alongside Father Ajamie for nearly five years at St. Monica Parish in Indianapolis. Around the same time that Father Taylor came to St. Monica, Father Ajamie hired Mary Jo Thomas-Day to be its director of religious education. More than three decades later, Thomas-Day is still leading the parish’s catechetical programs and sees her first pastor’s lasting influence on it. Even in retirement and when his health was starting to fail, Father Ajamie continued to be a tireless advocate for those causes he was passionate about, including the permanent diaconate. “Had it not been for his constant vigilance and persistence over the years, I’m not sure we would have the ministry of the permanent deacon yet,” Msgr. Schaedel said. Father Albert Ajamie was born on Dec. 15, 1923, to Roger and Katherine (Tradd) Ajamie, who were members of St. Joseph Parish in Indianapolis. He attended St. Joseph and St. John schools in Indianapolis before becoming an archdiocesan seminarian. He received his priestly formation at Saint Meinrad Minor and Major Seminaries in St. Meinrad and at the Theological College of The Catholic University of America in Washington, D.C.
Archbishop Paul C. Schulte ordained Father Ajamie to the priesthood on May 30, 1950, at the Archabbey Church of Our Lady of Einsiedeln in St. Meinrad. Father Ajamie’s first pastoral assignment was as associate pastor of St. Andrew the Apostle Parish in Indianapolis, where he served from 1950 until he was assigned as the associate pastor of St. Mary Parish in North Vernon in 1953. In 1957, Father Ajamie was named the associate pastor of Holy Trinity Parish and became a professor of theology at Marian College, both in Indianapolis. In 1959, he was named the first director of the archdiocesan liturgical apostolate. During the Second Vatican Council, Father Ajamie led the first archdiocesan liturgical commission that helped implement the liturgical reforms that the council brought about. During that same time, Father Ajamie served as the pastor of Holy Angels Parish in Indianapolis from 1964-70. He was the pastor of St. Rose of Lima Parish in Franklin from 1970-74, and the pastor of St. Monica Parish in Indianapolis from 1974-83. 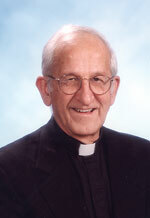 In 1983, Father Ajamie was appointed the pastor of St. Mary Parish in Lanesville, where he ministered until 1989. In 1989, he became the pastor of St. Thomas the Apostle Parish in Fortville. While continuing as pastor of St. Thomas Parish, in 1993, Father Ajamie also became the chaplain for the National Council of Catholic Women. He retired from active ministry in 1994. In addition to his sister, Lorraine Ajamie, he is survived by three nieces.